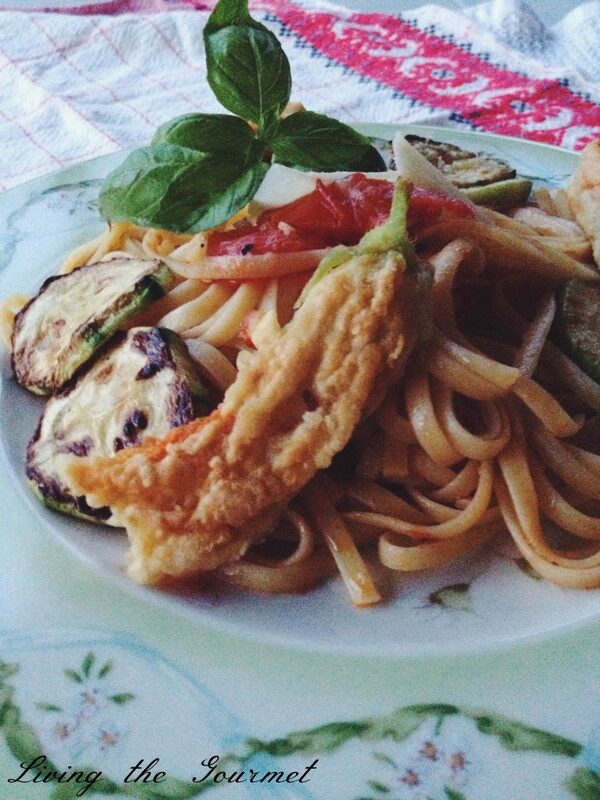 Fried pumpkin and zucchini flowers are considered ‘peasant food’ in Italian culture. As a little girl my mother would ask me to go to the garden and pick these beautiful bright flowers. I would pick a bunch of these beauties; and bring them in and watch and learn as she prepared them. As she fried these “garden treasures” I would wait with anticipation. I knew how delicious these would be. Today as I do the same, my heart goes back to that little kitchen where I learned these treasured delicacies and I share these memories and food with my son and daughter. Heat a large cast iron frying pan with a ¼ inch of canola oil; add the zucchini slices and fry until golden. Do not over crowd the pan. Place the slices on a plate prepared with a paper towel to absorb the excess oil. Rinse the flowers with cold water in a colander. Gently pat the flowers dry. Place the flour in a shallow bowl; in another shallow bowl beat the egg with a splash of water. Dip the flowers first in the flour; then the egg-wash and again in the flour. Heat the frying pan with a ¼ inch of canola oil and place the prepared flowers in the heated oil. Do not over crowd the pan. Fry until slightly golden; then place the flowers on a plate prepared with a paper towel. Wipe any crumbs from the frying pan. Heat a frying pan with two or three tablespoons of olive oil. Add the tomatoes, garlic and lemon slices. Sauté the tomatoes on a medium heat until the tomatoes are soft and a sauce like consistency; add the seasonings to taste and the fresh basil. Prepare the pasta as the sauce cooks. Place the pasta in the sauce and toss. 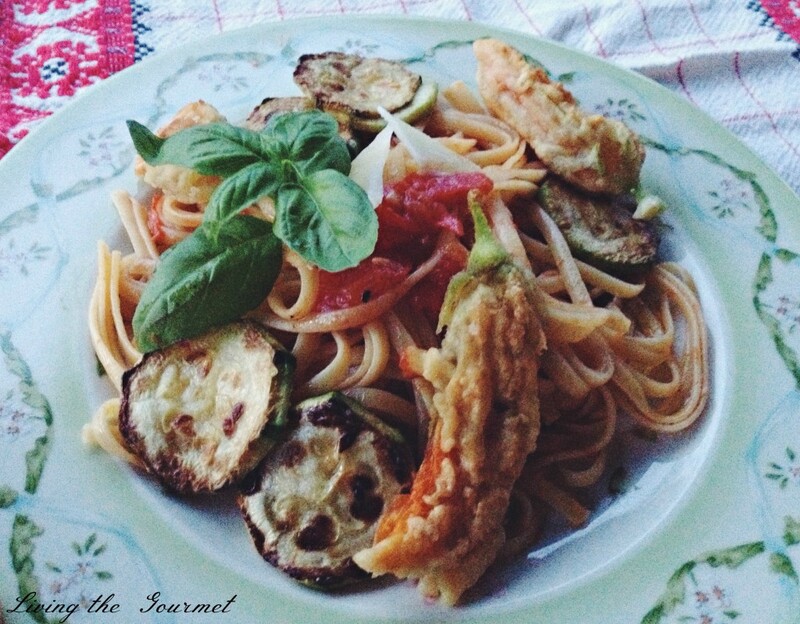 Plate the pasta; garnish with the fried zucchini and the fried flowers. 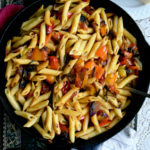 Finish the dish with dashes of red pepper flakes; a drizzle of olive oil and fresh Romano cheese shavings. I am entering this dish into the Tuscany Now Cook-Off Competition. Delicious Catherine!! Tasty and yummy!! Kisses!! 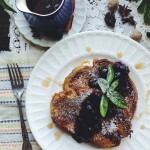 This is a must make recipe , , thank you for sharing this delicious recipe . Good to see yet another great sounding recipe from you Catherine. I have never tried frying squash flowers as I tend to let them fruit. Maybe it's something i will give a go this year though!! This looks so beautiful! I always wonder what to do with the blossoms. Thanks for the lovely post! 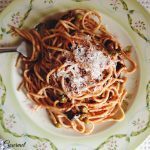 Delicious spaghetti with fresh fried pumpkin flowers Catherine, thanks for sharing with Hearth and Soul blog hop. pinning and tweeting it. I didn't know you could cook and eat pumpkin flowers! 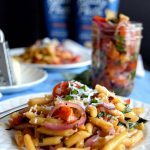 This recipe looks absolutely delicious and I would love to try it some time. Thank you for linking up at #MerryMonday! Beautiful dish! 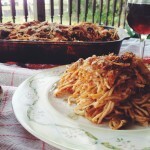 I love the idea of placing fried pumpkin blossoms over pasta. I have enjoyed fried zucchini flowers dining out, but I have never made them at home. It is time, thanks for sharing, looks delicious. 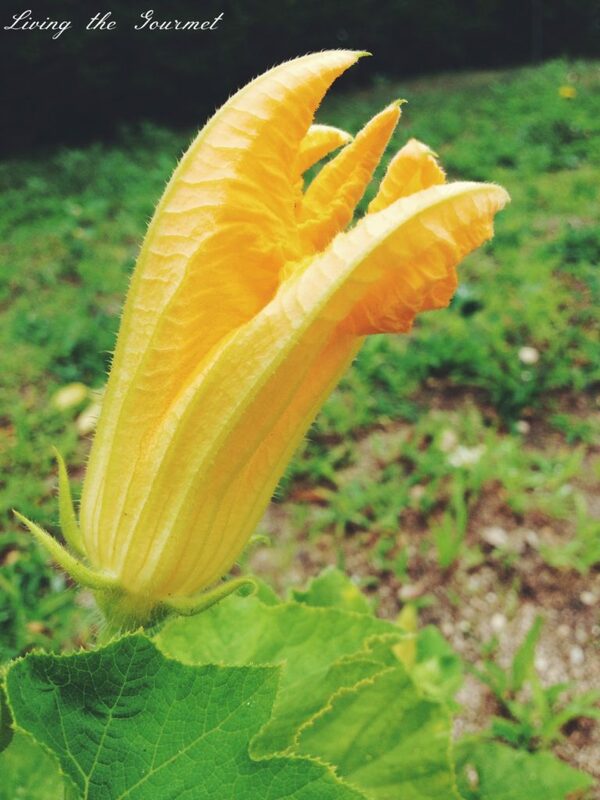 Dear Catherine, I have some squash flowers blooming right now. Have never prepared them but glad to learn how. Edible flowers are the best. I remember at the rehearsal dinner for our wedding - the look of confusion on my fiancee's face as the individual salads arrived, adorned with many edible flowers. Twenty-three years later, he'll eat flowers without a thought. That, Catherine, is progress!! HA. Have a wonderful weekend and I hope it includes some rest. What a beautiful, beautiful dish! 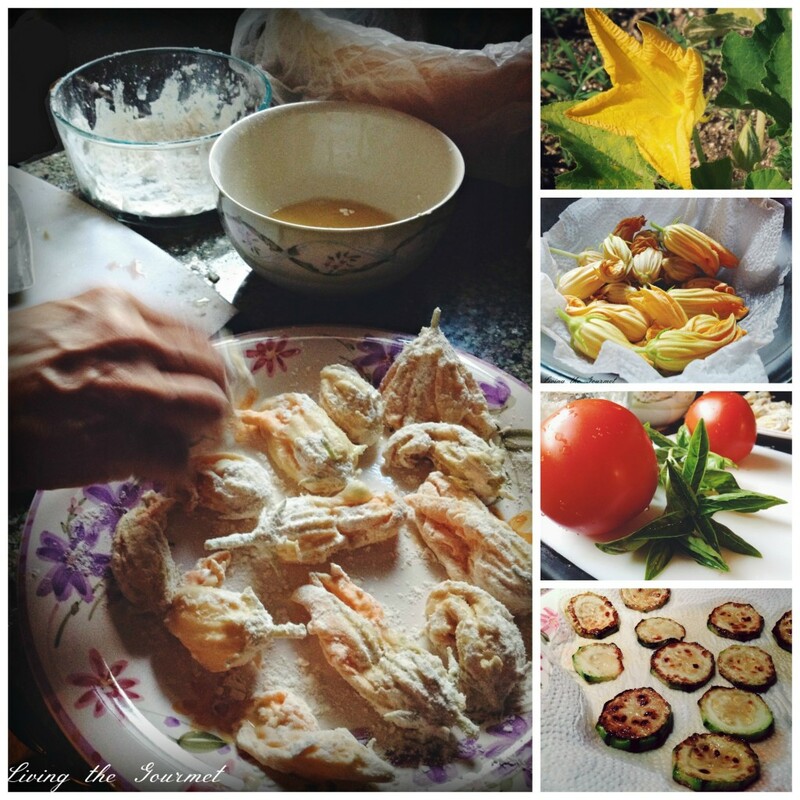 Zucchini blossoms are one of my favorite food memories from childhood - I love them! Such a tasty dinner idea! I need to add this to my plans soon! 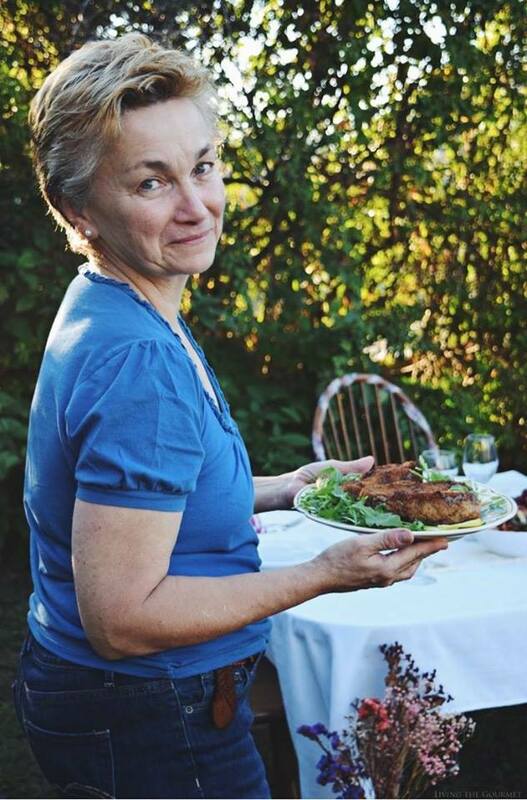 Dear Catherine, I have yet to try pumpkin and zucchini flowers - this recipe sounds so exquisite! now I gotta get my hands on some pumpkin and zucchini flowers for sure! Oh my goodness...this sounds so amazing! 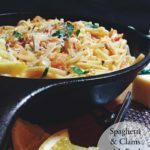 :) I would love for you to share this with my Facebook Group for Crafts, Recipes, and Tips and Tricks: https://www.facebook.com/groups/pluckyrecipescraftstips/ Thanks for joining Cooking and Crafting with J & J!